The weather (at least in the Midwest) is finally getting warm, which means the girls and I are outside as much as possible so we can get our Vitamin D fix before the never ending Midwest winter sets in. Being the fair skinned gals that we are, sunscreen is a must. The problem is that many of the commercial sunscreens on the market are full of chemicals and preservatives that are terrible for your body and some of them have even been linked to cancer (ahhh the irony). Luckily, there are some options out there that are safe for both you and your kiddos and also provide fabulous sun protection! I have a couple of favorites that we’ll look at below, but first I thought we should look at the ingredients I avoid when looking for the right sunscreen for me and my kids. If you want more info take a look at the EWG Sunscreen Database. Parabens: This is a nasty little preservative that has been linked to cancer and hormonal disruption. Oxybenzone and Octinoxate: These are the main active ingredients in many commercial sunscreens. They are appealing because they go on without leaving any white film and also work well in the popular spray sunscreens on the market. However, they are linked to hormone disruption, endometriosis, and reproductive abnormalities. A safer alternative is titanium dioxide or zinc oxide. 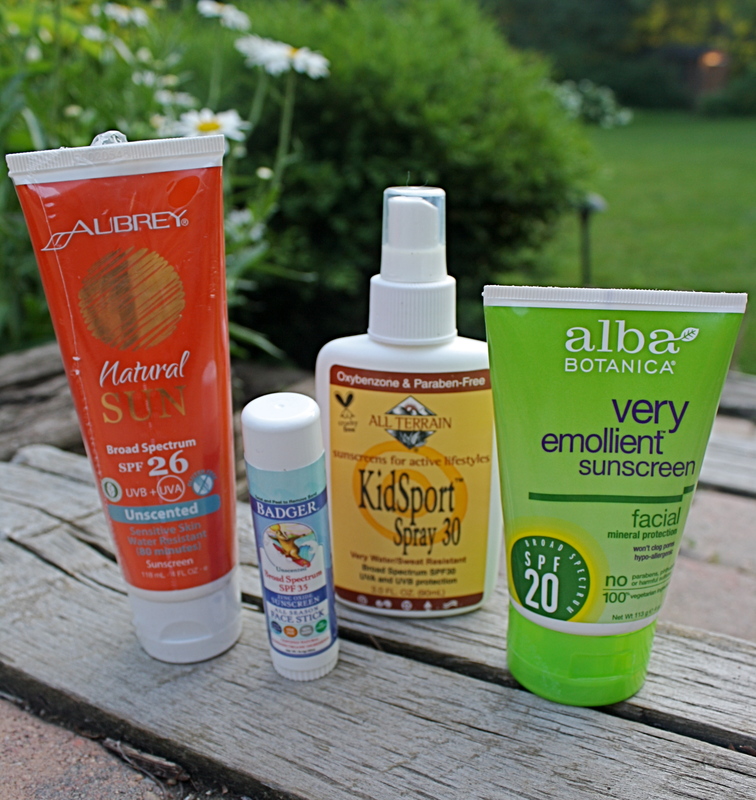 There are plenty of sunscreens on the market that are healthy alternatives, but here are a couple that I use on myself and/or my kids. Aubrey Organics Natural Sun Unscented Sunscreen – I love this sunscreen because it leaves almost no white residue that is common with zinc oxide sunscreens. It has a fairly runny consistency so it rubs in easily and is great for both kids and adults. It’s also water resistant for up to 80 minutes, which is a bonus for all you pool goers. Badger All Season Face Stick- There are just a few ingredients in this face stick and most of them are organic so I feel good about using this on my kids. I’ll admit that it does leave a slight white film, but it’s perfect for my fair skinned little peanut. Alba Botanica Very Emollient Facial Sunscreen: This is my go to facial sunscreen because it is non-oily and rubs in easily. All Terrain KidSport Spray: This is probably my favorite brand for my kids. They have several formulations, but this spray version is awesome because it is super easy to apply and is very water/sweat resistant . You can buy all of these sunscreens at Vitacost and I’ve also seen several at Whole Foods. These are all just suggestions so be sure to explore and find the ones you like best for yourself!